Can Xargay is a beautiful and spacious villa, a Millennial Traditional Catalan Villa of XI century with a special charm, situated in the village of Mata. It's in a quiet, safe neighborhood and the neighbors are very warm and friendly. 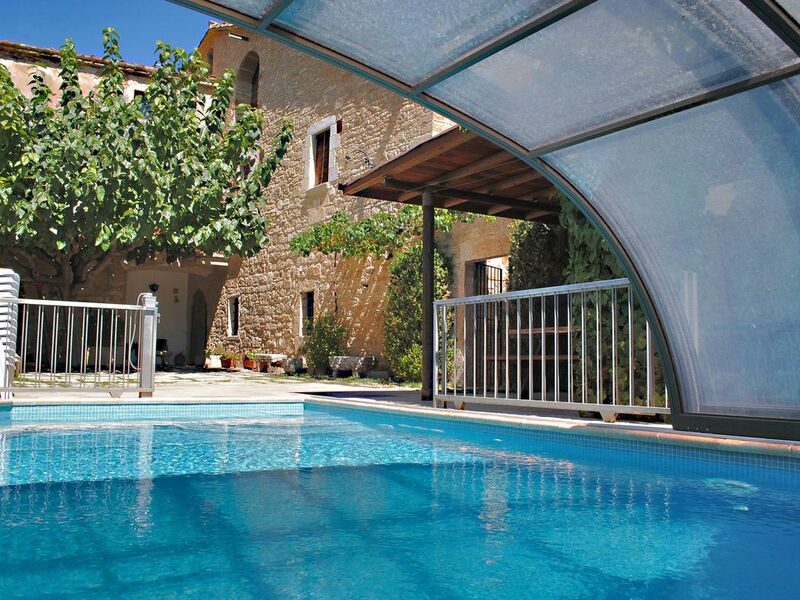 The house is in a walking distance from shops and restaurants and a short drive from Banyoles lake (only 2 km. ), 35 km. from Costa Brava beaches, 25 km. from the International Airport of Girona-Costa Brava and 115 km. from Barcelona city. The supermarkets and the hospital are located 1 km. from the house. Outside, there is a covered porch with a barbecue which is ideal for eating outside all year round, swings for children and a nice heated private swimming-pool with an hydromassage bench. The swimming-pool is closed in December, January and in February. It is appropriate to spend some days with the friends, family reunions, partying, birthdays… or just to spend some calm and break days. The perfect situation of the house allows you to do several excursions around Pla de l’Estany by bike or on foot, through the lake surroundings declared of natural interest. You can also visit Girona province since the house lays in the center of it. Also, there are horses 2 km. far. Car is not necessary because 300 meters from the house there is public transport (bus). Besides, private transfers from/to Airport are available. WELLNESS TREATMENTS: Can Xargay brings you closer to the senses world through a wide range of relaxing therapies where time will stop and your senses lead you to an exotic world of sensations. All services are offered by a licensed physiotherapist in Can Xargay wellness room. All products used are natural. CYCLING HOLIDAYS: Life looks different when you're sitting on a bicycle: everything takes on the right speed and you become part of a landscape in motion. In Can Xargay there are lots of kilometres of routes and roads ideal for cycling with the family or with friends, in complete safety, so that you can take in every stretch of the region as if yo were re-creating it each time you pedal. You set the speed when you're on your bike and the infinity of proposals available will adapt to it perfectly. Unique spots close to the sea or in the mountains, to find the complicity that comes to those who ride bikes. After the cycling, enjoy a spa treatment in Can Xargay. Besides, the house has got a specific enclosed patio to lock your bikes up. HIKING: There are many routes from Can Xargay. They have trail markers and are organised in a network of loop trails, and hikers can adapt the route or the stages according to their requirements or level of preparation. GOLF: The house is located 9km from Girona Golf. It's an 18-hole, par 72 golf course designed by the English architect F.W. Hawtree, seeded entirely with Penncross, the best quality grass for playing golf. A course that is entirely adapted to its natural surroundings, featuring an advanced sprinkling system using regenerated water from Girona's purification plant, and meeting the most up-to-date environmental standards. The top nine holes are extremely competitive – their design requires players to use all the clubs in their bags. The bottom nine are simply spectacular, with all the tees set atop walls built with Girona stone, offering impressive panoramic views of the fairways. It is a true pleasure to follow the flight of the ball towards its destination, and encourages many players to take out their woods. Hello! We are Xargay's family. Our family and our ancestors we have been living in Can Xargay until 1999, when we decided to rent it as a holiday rental villa. Pere is a builder and he's a passionat man with his job. He rehabilitated and restored the house with all the details. He is the father of the family. Dolors, a kind and tireless worker, prepares the house for you. She is the mother of the family but she's also the pillar of the house. Raquel has got a chemical profession. She loves learning foreign languages but she also likes welcome you to the house and she explains to you all the activities that you can do in the area. Sílvia is biologist, cheerful and hardworking. She's the middle sister. Sandra is a great professional in the world of physiotherapy and aesthetics. She loves the relaxation and wellness. She will take care of you. Can Xargay is a millennial history house. It's especially dedicated to the family tourism. The house is rented exclusively. The children will have fun thanks to the facilities (swimming pool, games room, exclusive activities ..). But what for the adults? So while the kids have fun, we have a place for the wellness and disconnection: Can Xargay Inspira place, an ideal place to relax. We love to make you feel at home and we hope to meet you soon! The villa has got all the benefits that you will need. For example, there are wifi access, TV satellite (to see international channels in your country), there is a heated swimming-pool with an hidromasage bench (just for you), it's very close to the shops and restaurants (in a walking distance). Car is not necessary because there is public transport only 300 meters from the villa. And so on... We are sure that you will like and enjoy it!! Central heating in all the house. In summer, we provide beach towels too. We offer you a wellness room in the house where you can enjoy different wellness treatments thanks to a licensed physiotherapist. We provide wood stove in winter for the fireplace. The sofa is big enough for sitting 20 people. There are 2 refrigerators with freezers. We have a little library with books for all ages as well as children's books. There is a games room in the house where you can find games for all children ages. There are swings in the garden. 20% of discount for boating services in Banyoles lake. Playing paddle is possible. 5 minutes on foot there is a Paddle company where they offer you balls and rackets. The property is adapted for wheelchair users: Access: Property access road is in the same level and smooth. There is a nearby setting down point for vehicles and a dropped kerb at the setting down point. Corridors and doors are wide enough for easy passage, and there should be no steps to the main areas of the property Bedroom: There is a bedroom on the ground floor. Bedrooms are suitable for a wheelchair user and all main sockets, light switches and alarm cords within reach from a seated position. Bathroom: The bathroom has got a wheel-in (level access) entry to the shower or bath. There is a fold-down shower seat. Taps and grab rails are accessible from a seated position. There are enough space to transfer from chair to toilet safely with appropriate handrails. Kitchen facilities: There is a microwave at an accessible height. A secured private pool that is for the exclusive use for guests staying in our property. Besides, it has got a hydromassage bench. The swimming-pool is closed in December, January and in February. Beautiful, clean, spacious and well-appointed villa. Accommodates large groups easily. 16 family members with ages ranging from 12 to 66 comfortably enjoyed a week at the villa. I would recommend the accommodation at the drop of a hat. We have all had a wonderful holiday in superb accommodation. The villa is very well appointed and comfortable. Raquel and family have been extremely helpful in organizing various transports for us. The Catalan meal they did for us was fantastic which all the adults enjoyed tremendously. Great place, great people, fantastic paella and very helpful information throughout our entire stay. Our family had a wonderful stay at Can Xargay house. We were pleased to see the house was so well equipped and it had a beautiful ambiance. True feeling of relaxation and luxury. Our big family of 19 people containing people aged 1-71 years have enjoyed being on vacation in your house. We had a fantastic holiday in a fantastic house! You have been incredibly helpful and very nice. Everything in the house worked perfectly. The house has a super location for both relaxation and to visit the big cities. We hope to come and visit you again. Thanks for a super holiday! What a beautiful house you have! We have had a great holidays could not be better. I loved every second being here. A fantastic house and grounds! Thank you so very much for the warm welcome and being there when we needed you! The weather was fantastic and the surroundings were lovely too! The house is located 50 meters from shops and 1 km. from supermarkets, 2 km. from Banyoles lake, 9 km. from Besalú village, 9 km. from Girona city, 15 km. from Natural Park of Volcanic Zone, 35 km. from Costa Brava beaches, 35 km. from Figueres (Dalí Museum), 60 km. from the ski station, 110 km. from Barcelona city. COSTA BRAVA: Like a canvas where nature has intended to combine with exquisite delicacy the intense green of the pine groves, the massive steadfastness of the rocks, the softness of the golden sands and the deep, dazzling blue of the sea - that is the Costa Brava. Frommer's Magazine from US and National Geographic have published in October 2011 the Best Destinations of the World for 2012 which are Girona and the Costa Brava. Exuberant Barcelona has long hogged the limelight, but its little sister Girona is stepping out from the wings. This diminutive city in northern Catalonia packs a cultural punch that is the envy of many a larger destination, with a superb dining scene to match. Girona's historic quarter, a secretive jumble of medieval mansions and courtyards crowned by a magnificent cathedral, is piled up on the eastern bank of the River Ter. To the west of the river, elegant avenues laid out during the 19th century are lined with smart boutiques and cafés. The lofty peaks of the Pyrenees form a violet smudge on the horizon and the rugged coves of the Costa Brava are just a short drive away. GASTRONOMY: Gastronomic mecca Celler de Can Roca, voted the best restaurant in the world by Restaurant magazine. The best restaurant of the world was El Bulli located in Girona too in 2005 and for 5 years. SHOPPING: As you stroll through the romantic historic quarter of Girona, the capital of the province, why not take advantage to do some shopping in the exclusive luxury boutiques and shops that you come across on your way? Another option would be to pay a visit to La Roca Village, a chic outlet in La Roca del Vallès, with more than one hundred designer label boutiques for chic shopping. SKI: The Vallter 2000 ski station is situated 60km from the house. Vallter 2000 is surrounded by peaks, some exceeding 2,800 meters, the base station is located at 2,000 meters above the valley of the River Ter. It's a privileged location since it gives the visitors a unique and exceptional views. Since the 2535 m level you can see the bay of Roses and the Cap de Creus (Costa Brava). This proximity to the sea makes the eastern storms leave snowfall can exceed one meter in height. Vallter where the snow is more Mediterranean. -The mountain resort of Vall de Núria is situated 65km from the house. Discover an unparalleled environment where the waters of the Núria river can only run its course thanks to the deep narrow gorges that have been cut through this hard rock, until you arrive at the valley of the Freser, a river which flows into the great Ter at Ripoll. The prices don't include the price of the heated swimming-pool in low season. Please, consult us the prices because it depends on the month of the year. The price includes towels, bed linen, beach towels, the whole house and the private swimming-pool with an hydro massage bench, Internet access,... We accept short breaks in low season even weekends. Weekly bookings from June to September run from Saturday to Saturday. The rest of the year, weekly periods are flexible.